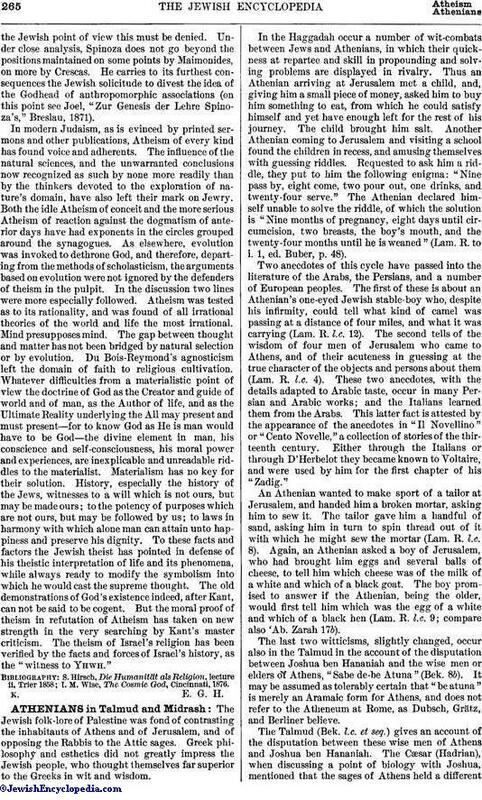 The Jewish folk-lore of Palestine was fond of contrasting the inhabitants of Athens and of Jerusalem, and of opposing the Rabbis to the Attic sages. Greek philosophy and esthetics did not greatly impress the Jewish people, who thought themselves far superior to the Greeks in wit and wisdom. In the Haggadah occur a number of wit-combats between Jews and Athenians, in which their quickness at repartee and skill in propounding and solving problems are displayed in rivalry. Thus an Athenian arriving at Jerusalem met a child, and, giving him a small piece of money, asked him to buy him something to eat, from which he could satisfy himself and yet have enough left for the rest of his journey. The child brought him salt. 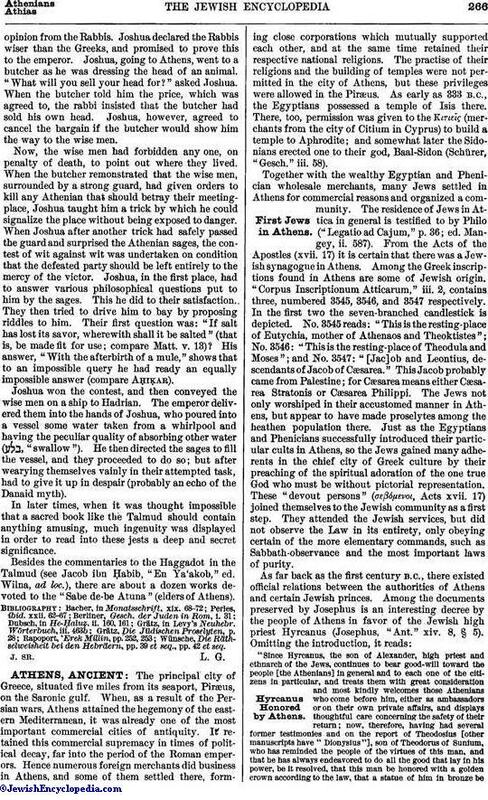 Another Athenian coming to Jerusalem and visiting a school found the children in recess, and amusing themselves with guessing riddles. Requested to ask him a riddle, they put to him the following enigma: "Nine pass by, eight come, two pour out, one drinks, and twenty-four serve." The Athenian declared himself unable to solve the riddle, of which the solution is "Nine months of pregnancy, eight days until circumcision, two breasts, the boy's mouth, and the twenty-four months until he is weaned" (Lam. R. to i. 1, ed. Buber, p. 48). Two anecdotes of this cycle have passed into the literature of the Arabs, the Persians, and a number of European peoples. The first of these is about an Athenian's one-eyed Jewish stable-boy who, despite his infirmity, could tell what kind of camel was passing at a distance of four miles, and what it was carrying (Lam. R. l.c. 12). The second tells of the wisdom of four men of Jerusalem who came to Athens, and of their acuteness in guessing at the true character of the objects and persons about them (Lam. R. l.c. 4). These two anecdotes, with the details adapted to Arabic taste, occur in many Persian and Arabic works; and the Italians learned them from the Arabs. This latter fact is attested by the appearance of the anecdotes in "Il Novellino" or "Cento Novelle," a collection of stories of the thirteenth century. Either through the Italians or through D'Herbelot they became known to Voltaire, and were used by him for the first chapter of his "Zadig." An Athenian wanted to make sport of a tailor at Jerusalem, and handed him a broken mortar, asking him to sew it. The tailor gave him a handful of sand, asking him in turn to spin thread out of it with which he might sew the mortar (Lam. R. l.c. 8). Again, an Athenian asked a boy of Jerusalem, who had brought him eggs and several balls of cheese, to tell him which cheese was of the milk of a white and which of a black goat. The boy promised to answer if the Athenian, being the older, would first tell him which was the egg of a white and which of a black hen (Lam. R. l.c. 9; compare also 'Ab. Zarah 17b). The last two witticisms, slightly changed, occur also in the Talmud in the account of the disputation between Joshua ben Hananiah and the wise men or elders of Athens, "Sabe de-be Atuna" (Bek. 8b). It may be assumed as tolerably certain that "be atuna" is merely an Aramaic form for Athens, and does not refer to the Atheneum at Rome, as Dubsch, Grätz, and Berliner believe. The Talmud (Bek. l.c. et seq.) gives an account of the disputation between these wise men of Athens and Joshua ben Hananiah. The Cæsar (Hadrian), when discussing a point of biology with Joshua, mentioned that the sages of Athens held a differentopinion from the Rabbis. Joshua declared the Rabbis wiser than the Greeks, and promised to prove this to the emperor. Joshua, going to Athens, went to a butcher as he was dressing the head of an animal. "What will you sell your head for?" asked Joshua. When the butcher told him the price, which was agreed to, the rabbi insisted that the butcher had sold his own head. Joshua, however, agreed to cancel the bargain if the butcher would show him the way to the wise men. Now, the wise men had forbidden any one, on penalty of death, to point out where they lived. When the butcher remonstrated that the wise men, surrounded by a strong guard, had given orders to kill any Athenian that should betray their meetingplace, Joshua taught him a trick by which he could signalize the place without being exposed to danger. When Joshua after another trick had safely passed the guard and surprised the Athenian sages, the contest of wit against wit was undertaken on condition that the defeated party should be left entirely to the mercy of the victor. Joshua, in the first place, had to answer various philosophical questions put to him by the sages. This he did to their satisfaction. They then tried to drive him to bay by proposing riddles to him. Their first question was: "If salt has lost its savor, wherewith shall it be salted" (that is, be made fit for use; compare Matt. v. 13)? His answer, "With the afterbirth of a mule," shows that to an impossible query he had ready an equally impossible answer (compare Aḥiḳar). Joshua won the contest, and then conveyed the wise men on a ship to Hadrian. The emperor delivered them into the hands of Joshua, who poured into a vessel some water taken from a whirlpool and having the peculiar quality of absorbing other water ( , "swallow"). He then directed the sages to fill the vessel, and they proceeded to do so; but after wearying themselves vainly in their attempted task, had to give it up in despair (probably an echo of the Danaid myth). In later times, when it was thought impossible that a sacred book like the Talmud should contain anything amusing, much ingenuity was displayed in order to read into these jests a deep and secret significance. Besides the commentaries to the Haggadot in the Talmud (see Jacob ibn Ḥabib, "En Ya'akob," ed. Wilna, ad loc. ), there are about a dozen works devoted to the "Sabe de-be Atuna" (elders of Athens). Wünsche, Die Räthselweisheit bei den Hebräern, pp. 39 et seq., pp. 42 et seq.